There are some less risky ways for how to lower your bills and everyday expenses. (MONEY Magazine) -- With the weak economy, stagnant wages and rising expenses, belt tightening is the new norm. Here are some tips on how you could lower your everyday bills. The cost: On average, about a quarter of what homeowners ages 35 to 55 spend each year goes toward their mortgage, says the Bureau of Labor Statistics. Cut it down: Thanks to the shaky economy, 30-year fixed loans were recently at a record low of 4.31%. So even if you refinanced two years ago -- when rates were a point higher -- you should run the numbers again (use the refinance calculator at HSH.com). And see if you can swing a 15-year loan: If you took out a $250,000 30-year loan at 5.47% in 2003 and refinanced to a 15-year at 3.55% today, you'd up your monthly payment by only $145, save $94,200 in interest over the life of the loan, and pay off your mortgage seven years sooner. Send The Help Desk questions about ways to lower your bills. The cost: The average annual wireless phone bill is now $1,152, up 52% from 2006, says J.D. 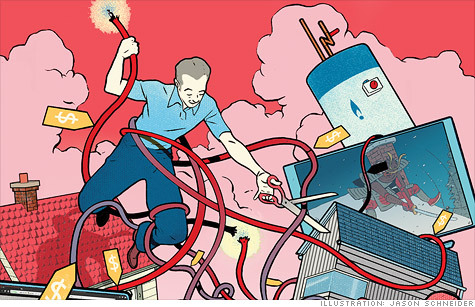 Power, and cable, Internet, and landlines together run an average of $1,788 a year. Cut it down: When your cellphone contract is up, ask about a no-contract plan. Many carriers offer these nonadvertised deals, which may give you the same number of minutes for less (you won't get a price break on a new phone). To lower your cable bill, try switching providers or unbundling plans (use the tool at BillShrink.com). The cost: Households that use heating oil pay $320 a month, on average, for heat during the winter season (gas users pay $160). Cut it down: See if your utility company offers a free or low-cost energy audit, says Bruce Harley, technical director for Conservation Services Group. Then check if your state offers incentives for improvements (see dsireusa.org or energyideas.org). Massachusetts, for example, will pay 75% of the cost of new insulation, up to a max of $2,000.